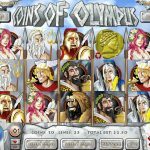 Coins of Olympus was first released in 2013 by Rival. As you can expect it looks a bit dated when compared to the latest games. Nevertheless, the game is fun and pays well so what more can you ask? If you’re a Greek / Roman mythology fan then you’d like the graphics and references in this game. The theme shows almost every god and goddess in the mythology. They each have a different power which makes the game very enjoyable. To get the max jackpot you need to get five Poseidon symbols. Not an easy task but spotting Poseidon in real life is even harder. The wild symbol is the Silver Coin. It can expand across the reel to replace other symbols and can potentially bring you a very nice prize. There are two scattered symbols in this game. The Gold Coin is the first and can reward you with free spins. 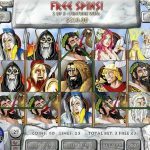 You simply need to get 3 or more such coins to trigger the free spins where 3,4 and 5 coins will bring you 5,10 and 20 free spins respectively. Oh and all wins during the free spins rounds are tripled! Not bad huh? Zeus is the other scatter and as the father of gods it brings you the bonus round when you get 3 of him anywhere on the reels. In this round you are actually playing as Hermes riding Pegasus with a mission to collect gold coins. If you collect enough you get a very nice prize. Making x15 of your stake is very very achievable. Coins Of Olympus doesn’t really look like a fun game but the looks is deceiving in this case. The game is actually fun, the scatter and Wilds are engaging and the payout is not bad at all. We think it’s a very nice game and it has our stamp of approval. Can’t get enough of history and mythology? Try going to ancient Egypt and play Cleopatra’s Coins a 5 reel slot by Rival.